A year ago, we heard reports of Sac-Anime moving to a new venue, what with its growing size (and the size of the Woodlake Hotel) in comparison and various horror stories pertaining to the hotel (mischarges, security, etc.). 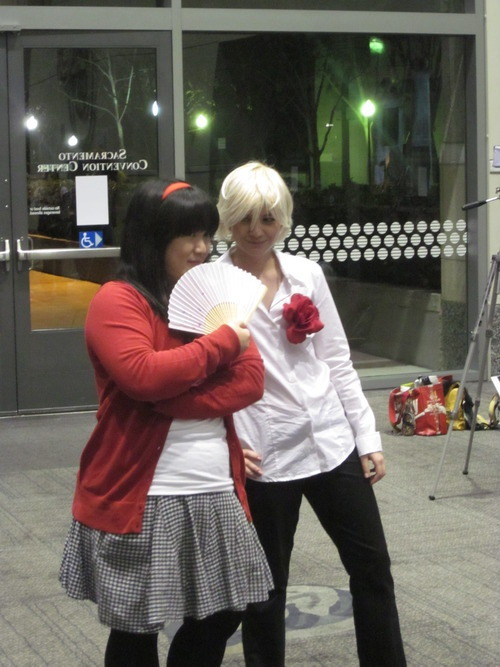 It is this past weekend that Sac-Anime was held at its new home at the Sacramento Convention center for the first time. The Sheraton Grand Hotel is the primary hotel for the convention and, along with the convention center, is located in the downtown bits of Sacramento, a dramatic change of pace from the open-airness of the Woodlake. It has a nice, huge lobby, large enough to hold a local-level convention by itself. Registration was located here, as was Cafe Hoshi, the gaming room, the viewing room, the panel room, among other things. The Sacramento Convention Center, across from the Sheraton, is at least two floors high, though the convention itself only took up one floor, as well as the first three floors of the neighboring Sheraton Hotel. Main events, autographs, and Dealer’s Hall in the con center, everything else in the hotel. There is also a Starbucks and a Wolfgang Puck Express located within the convention halls, although the latter was closed for most of the convention hours. A major advantage of this new location is the amount of indoor real estate. Sacramento can get fairly chilly--especially for skimpier cosplayers--during January, it being in the Central Valley where temperatures either border on freezing point or hit record highs whenever Sac-Anime takes place. 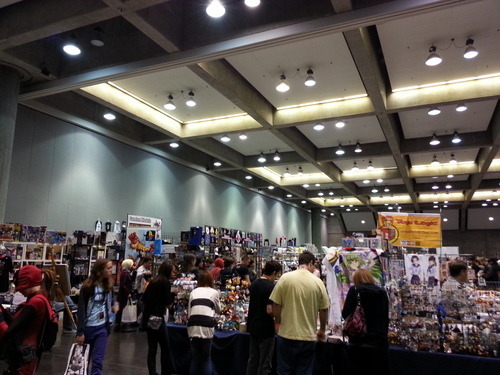 Notably, the Dealer's Hall was so big that it accomodated both the Dealer's Hall and the Artist's Alley and still have plenty of breating room, unlike the Dealer's Hall at the Woodlake. There are some food options—Subway, a few small-business places, and the always-open 7-11. Unfortunately, many eating establishments close early in this neck of Sacramento (as early as 6 PM) on Friday and Saturday, and all day on Sunday (Subway making a special exception for this particular weekend, and as mentioned, 7-11 is open 24 hours). If you’re willing to go a bit further out of your way, Jim-Denny’s serves some ace-tier breakfasts around the corner, and four blocks down J Street going East is the Old Spaghetti Factory—more on these in later posts. The gaming room, maintained by @T_BAGR, was now only one long narrow room instead of three separate rooms, making it fairly crowded and difficult to navigate. Game selection was less varied than previous Sacs, more on this later. Weather was a tad unfortunate. It rained for the latter half of Saturday, though I was prepared and brought an umbrella. 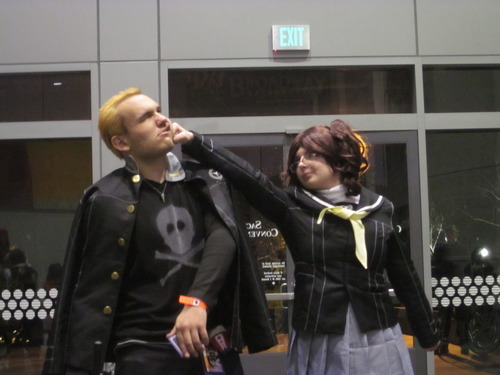 Which, hilariously, had to be peace-bonded despite not being part of any of my cosplays. After doing my packing, I left to pick up a few friends and we were on our way around 12:50pm. We made a food stop at In-N-Out along 205 in Tracy around 1:50pm, before resuming onwards. Our final arrival time at the Sheraton Grand was about 3:30 PM. I met up with Matt to pick up my room key, then went upstairs to meet with my roommates, who also happen to be my CCB colleagues. After filing my luggange into my room, I stepped out and readied for con activities proper. I had wanted to go to the Touhou gathering, but it had already transpired, having taken place at 2 PM. Though I wasn’t planning on cosplaying Reimu until the day after anyway. I went down to registration, which was on the mezzanine floor of the hotel in one of the ballrooms. Flashed my ID and business card, and received my badge posthaste. I met up with Katie, who was also registering, and we made for the dealer’s hall afterwards. We did a little walking around, and after some exploration of my own I found DoujinPress’s booth, selling their usual wares, some of them notably being Madoka and Touhou stuffs (the only booth in the Dealer’s Hall selling Touhou fanworks of any kind, even). They were selling some new things, including some small artbooks and some Touhou pairing buttons, but I decided to pass for now. Part of the appeal of Sac-Anime for me is the gaming room, so I went to check it out; it was back in the hotel on the 3rd floor. Games that I cared about were still being set up, so I decided to come back later. I met with some of the Touhou cosplayers that had attended the gathering earlier, though I didn’t really speak for long. The Shin Megami Tensei gathering was at 8 PM, and was held at the large indoor clearing by the fountains by the exit near the movie theaters. Attendance was fairly modest, with two thirds of Sac's CCB team, conveniently also Persona cosplayers, putting in an appearance. A few certain mainstays of SMT gatherings were sadly absent for one reason or another, but it was still a good opportunity to see the fandom demonstrate their creativity. I decided to double back to the gaming room again. One vertical monitor was set up and playing games, so I got to pop in a round or so. I also got to watch my friend David do a full run of The Legend of Zelda, and I got to meet up with longtime friend-who’s-local-yet-I-only-know-through-social-sites Suu. I mostly just chilled out in the room before retreating back. With Day 1 coming to an end, I had to prepare for my next cosplay, so I made for the bathroom, and not only showered myself but also shaved my legs, for my next cosplay was Touhou’s resident red-clad shrine maiden, Reimu. 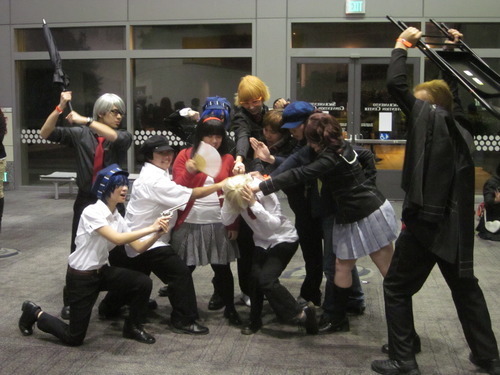 Friday is usually my “empty day” of Sac-Anime, though the SMT gathering helped liven up things a bit. In hindsight, I could’ve taken the opportunity to explore a bit more of downtown, but my aversion to a particular kind of weather inhibited that. Arguably, this was a busy day for me—Saturday ended up being more of a “chill out” day if anything.